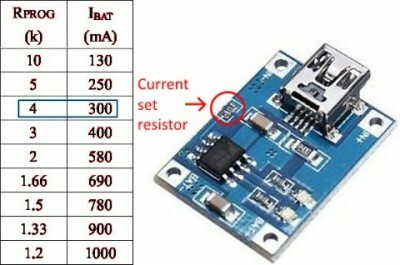 Li-ion battery chargers use the CC/CV algorithm. CC means Constant Current and CV is Constant Voltage. 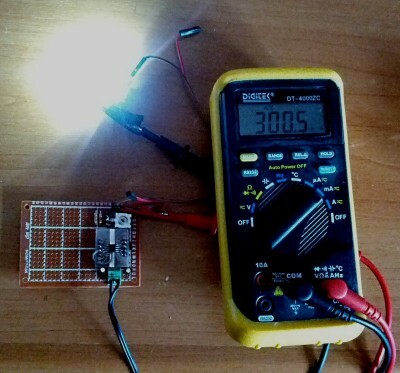 When a battery is under charge, the device supplies a constant current until a threshold voltage is reached (typical 4.2V), then applies a Constant Voltage. When the charging current drops below the 10% of the set value, the battery is disconnected (float). 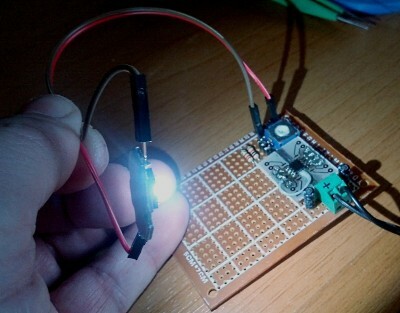 I tried to use a battery charger to light a white led at 300mA constant current. The trick is that the led (obviously) does not recharge, so the charger remains continuously in CC mode, with the current set as programmed. Now it’s time to test. I used a trimmer for setting the value of charging current. For 300mA the value must be 4K Ohm. 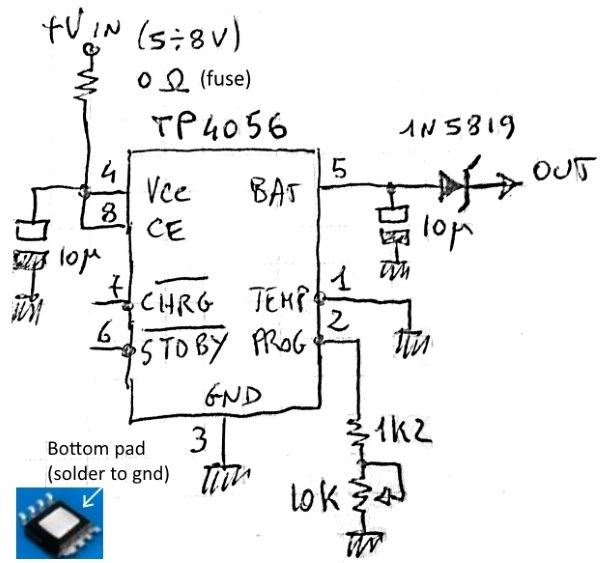 If you don’t want to use a trimmer, such non-standard value can be obtained paralleling two resistors: 10K and 6.8K (the result is 4.04K). 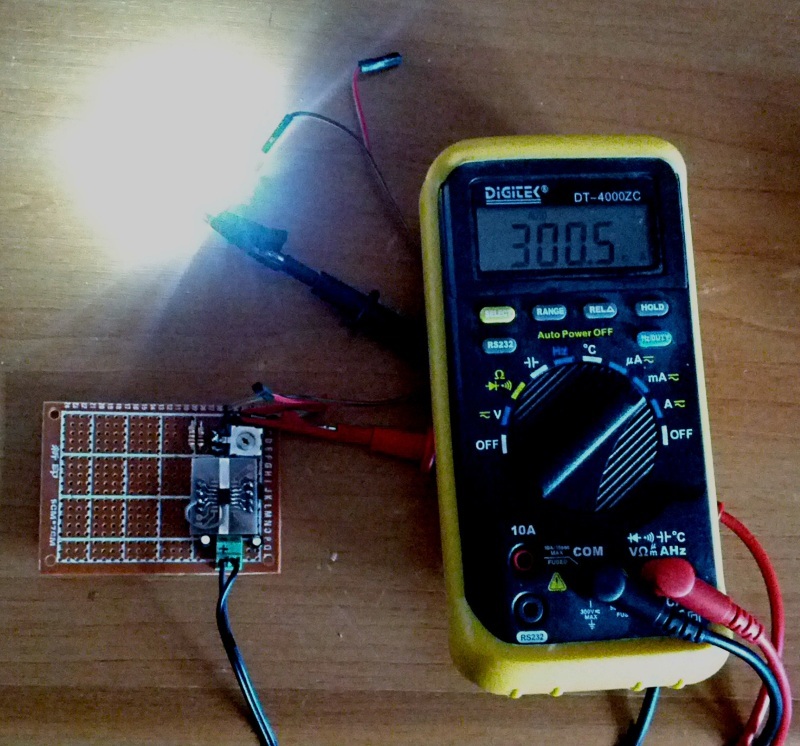 The image below shows the current measured with a multimeter. 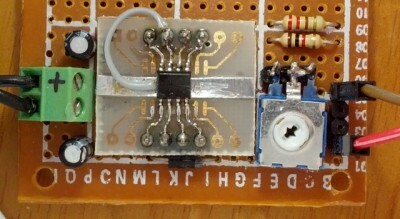 Note the 1N5819 diode at the charger output. This is important. 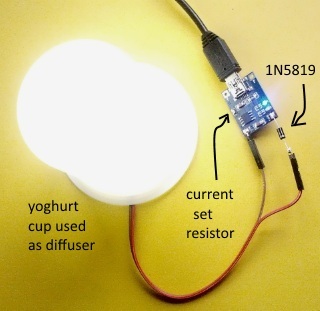 The white led I used has a typical Forward Voltage of 3.42 Volts and if you connect it directly to the BAT signal of the IC (pin 5) the charge does not start. You will have a current that is the 10% of your settings, so about 30mA. 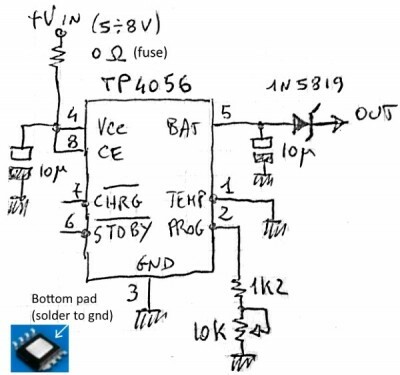 The IC “starts” if there is a voltage near 3.7V ; the diode 1N5819 has about 0.35V voltage drop at 300mA, so 3.42V of led plus 0.35V of diode makes 3.77V and the circuit start “charging” at 300mA. I also tested one commercial board I purchased some time ago on ebay. I just modified the charge set resistor and added the diode at the output. Please note that if you set higher currents, the IC will be hot. I don’t recommend current values higher than 300mA, without any thermal dissipation. This IC is not made to be a led driver. For professional results, use one made for that purpose. Here is a table for values of resistor to set a specific current and the position of such resistor on the circuit. This entry was posted in Hardware and tagged Constant Current, Led drive by Emilio P.G. Ficara. Bookmark the permalink.